In previous newsletters we’ve described two good reasons for attending KettleFest: the live music, and kids’ activities. This time we offer up a third reason: our awesome vendors! The artisan vendors invited to participate at KettleFest are an incredible group and will be bringing along many unique items to peak your interest. As just one example, the metal sculptures made by Jeff Mann (RK by Jeff Mann) – scrap metal parts welded together to create intricate animals and insects -- are unlike anything you’ve ever seen before! Several of our favorite artisan vendors from previous KettleFests are returning again this year: Bee Paper House (an amazing graphic artist, Brittany designs all of our maple syrup and honey labels); Bubbaloo Farm (handmade clothing items); Suds by Sasha (handmade bath and body products); Trim Soy Candles (soy wax candles in repurposed wine bottles); Karen For Your Skin (products from 100% essential oils); Lorraine’s Concrete Leaves (popular birdbaths using real leaves and concrete); The Misstique Collection (handcrafted jewelry); Mounds of Mud (pottery made right here in Fishers NY); Lisa’s Creations (wind chimes and other creations made from recycled glass); Northeast Iron and Tin (tinwares from Victor); and MCL Designs (handcrafted jewelry). Among our new vendors this year are Belove Handmade (extraordinary macramé); Emerson & Oliver (jewelry and more); and Rainmaker Designs (ceramic wall hangings by two exceptional local artists). The Art Barn at KettleFest will again feature the amazing artwork of Laurie Dirkx Photography; Mike Kraus Art; and Paul and Christine Knoblauch. Jim Coburn from Mount Morris will also be in the Art Barn. Jim is an award-winning wood sculptor of birds, and will be demonstrating his technique at a 12:30pm workshop. Speaking of workshops, Chef Jeffory McClean is returning this year to provide not just one, but three cooking demonstrations in the Kettle Ridge Farm tasting room. That’s a great thing, since his classes have proven extremely popular. Another popular workshop is the trail walk led by DEC forester Brice June. Brice is an expert on trees, mushrooms, and many other outdoor topics. Chef’s Catering is offering a full menu from their food truck, Le Petit Poutine will be in attendance with their Rochester-favorite poutine, Dave's Sidewalk Catering & Cafe (voted 2017's #1 Rochester street meat) will be cooking up burgers and sausage, and we'll be serving pancakes with real maple syrup, sausage, and pancake sundaes from the Kettle Ridge Farm food truck. The talented ladies of Starla Bake & Brew are coming back with their delicious baked goods and coffee drinks. You can even bring home a doggie bag to your pet filled with treats from BONES The Dog Bakery. For the 21+ crowd, The VB Brewery in Victor will be offering its own craft brews along with a selection of local wines and ciders, and the Honeoye Falls Distillery is providing free samples of its distilled products. Last newsletter we described the live music you’ll be able to enjoy at our upcoming KettleFest (Saturday, September 16 from 10am to 4pm). In this newsletter we explain another reason to attend: your kids will love it! KettleFest is a family-friendly event that will entertain and educate adults and children alike. The chicken races, which are run at three different times during the day, are a particular highlight for many. Our feathered flock will race through our special wire tunnel—aka chunnel—and kids who picked the winning chicken receive a small prize. Each of our chickens is sponsored by a local business and is adorned with a colored leg band. It’s huge fun! How appropriate it is that our major festival sponsor this year is a local business named Roosters! Roosters Men’s Grooming Center is a recently-opened men’s fine-grooming salon located downtown in the Village of Victor. We ask you to consider patronizing Roosters as well as the other chicken race sponsors listed at KettleFest.com. We will also be repeating our beehive box painting contest this year. Kids are invited to decorate one side of an actual beehive box (honey bees excluded!) in any way they want. 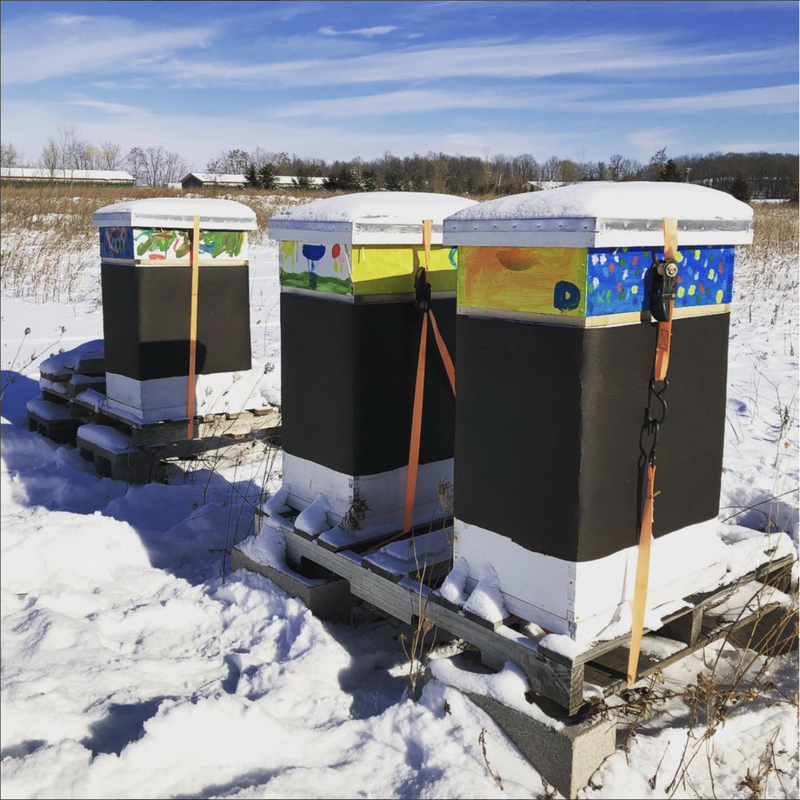 Not only is it great fun for them, but Kettle Ridge Farm ends up with some very colorful boxes that we actually put on the hives! Also back this year is Invictus Electrical with its interactive energy display for kids, and New York Life offering free child ID badges. Beyond those kid-specific activities, your children will enjoy just hanging out with you, listening to music, dancing and hula-hooping on hay bales, eating one of our special pancakes sundaes, going on a trail walk, and shopping our craft vendors. Remember, kids under 13 get in free! This year’s KettleFest on Saturday, September 16 will be no exception. We are tremendously excited about the groups we have coming to play. Starting off the day at 10:15AM is an amazing family bluegrass band from Attica called Anastazja. This band consists of sibling-musicians ranging in age from 2 to 20, along with Stacey, their mom. We first heard Anastazja last year at the Long Point Park Fiddlers Picnic and were absolutely blown away. Get to KettleFest early so you don’t miss their performance! Next up at 12:15PM is a real treat: a group from Rochester called Some Ska Band that we recently “discovered” playing at the B-Side in Fairport. If you’re not familiar with “ska”—a precursor to reggar—you are in for a very pleasant surprise. SSB plays ska (and other musical genres) exceptionally well with its vibrant horn section accompanying the guitars, drums, and vocals. This group will get you dancing on your hay bale! We wouldn’t be surprised if Some Ska Band provides one of the most talked-about sets in Kettle Ridge Farm’s festival history. Finally, at 2:15PM the Ruckus Juice Jug Stompers comes onto the outdoor stage. This band has taken Rochester by storm with its fun and eclectic instrumentation and jive-juicing jug music. You (and your kids) may go home looking for empty jugs, washboards, and kazoos to try on your own! We’re extremely fortunate to have them closing out KettleFest 2017. KettleFest will be held from 10AM to 4PM on Saturday, September 16 on the grounds of Kettle Ridge Farm at 515 Log Cabin Road in Victor. In addition to live music, the family friendly festival features over two-dozen artisan vendors, educational workshops and woods walks, food & drink, a beehive box painting contest for the kids, and our almost-world-famous chicken races. Admission is $6 per person (free for children under 13), with a reduced price of $3 per person after 2PM. We're Cooking Up Something New! 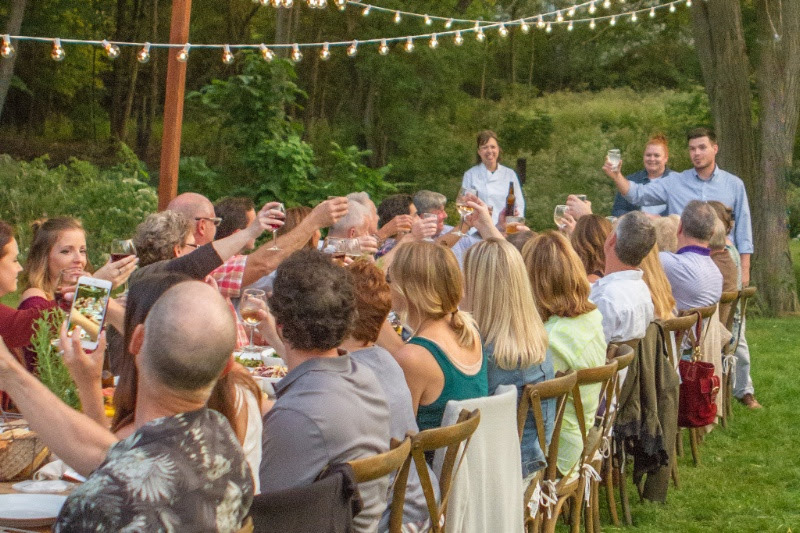 Introducing Dinner Under The Moon -- our new triannual outdoor dinner series at Kettle Ridge Farm co-hosted with our dear (and wildly talented) friends from Simply Beautiful Events and Root Catering. The first dinner is coming right up on Thursday, August 17 from 6-9pm and tickets are available for purchase now. This 100-seat, family-style dinner will showcase the late summer bounty of small artisanal farms in our little corner of the world...with a honey and maple twist, of course! A glass of red or white wine from the Finger Lakes is included with dinner, and all proceeds from the sale of additional beer, wine or cocktails will go to Camp Good Days & Special Times. 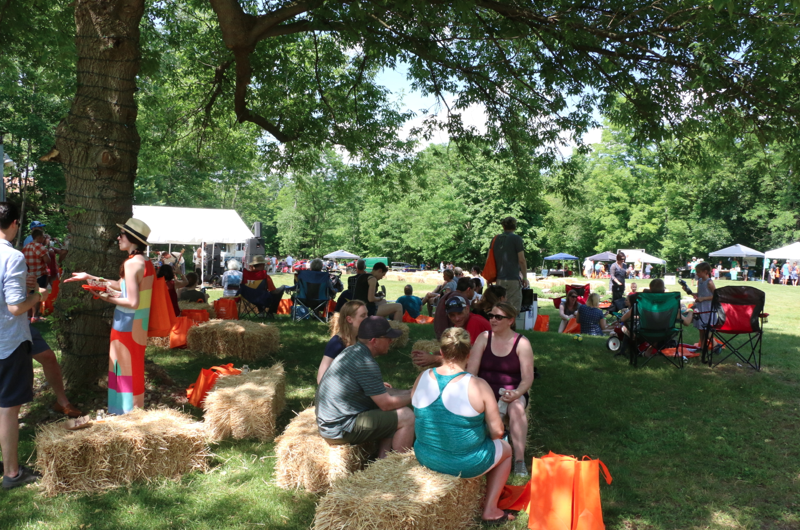 Thanks to everyone who came out to Kettle Ridge Farm last month on a hot and sunny Saturday for our inaugural Honey Dipper Festival. It was a terrific success, with over thirty food and beverage vendors handing out samples of their products, awesome music, and informative culinary demonstrations. Photos from the day can be found on our Facebook page. The event was a locavore’s dream, and we look forward to hosting another Honey Dipper Festival next year. Mark your calendars for June 16, 2018! We especially wish to thank all of our vendors, volunteers, and demonstrating chef Art Rogers from Lento Restaurant. And of course, a big thank you to our Honey Dipper Festival sponsors: Railside Market & Café, Friendly Ford, Farm and Country Insurance, and Wegmans. Believe it or not but we're only two months out from the third annual KettleFest on Saturday, September 16th. Mark those calendars! We're very excited for what's in store this year and will release more details next week... Stay tuned. 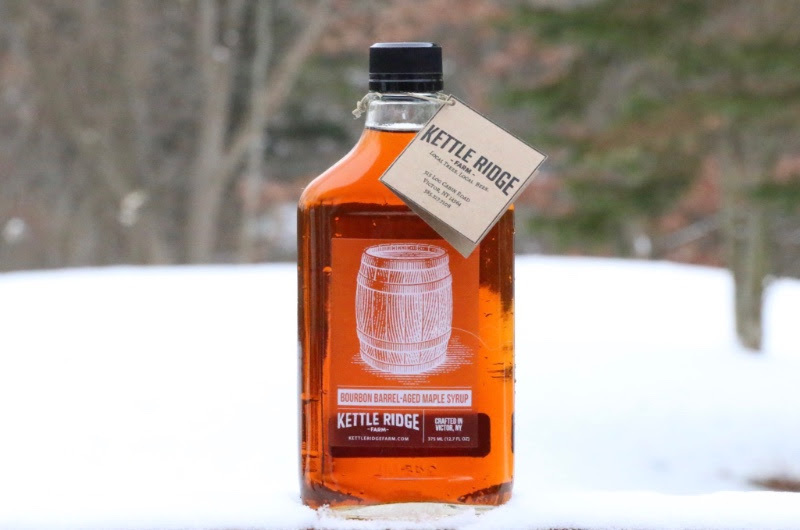 Thanks to everyone who came out to Kettle Ridge Farm last month to support KettleFest and to have a good time. We’re especially grateful for all the volunteers who provided their assistance. Over 1500 people braved the threat of rain—which ultimately consisted of two brief showers—for the workshops, music, vendors, kid activities, and food and drink. Check out photos from the day on our Facebook page! We would love to know what you thought of this year’s festival. Please take a minute and send us an email with your general thoughts and reactions, as well as any specific suggestions you have for next year. The honey bees at Kettle Ridge Farm have had a good summer, in spite of drought conditions. Our fall crop is less than expected in quantity but awesome in quality: deep rich honey made from goldenrod, aster, and other wildflowers. We anticipate selling out before too long so if you are hoping to purchase honey as holiday gifts please get your order to us as soon as you can! Fall is a great time to get out in the woods. The cooler temps, foliage, and lower vegetation levels makes the work much more enjoyable. We've been busy setting up new maple lines and fixing damaged lines, mostly from fallen trees and branches that came down during the offseason. We're shooting to tap an additional 300-400 trees this year to bring our tap total well over 1300. With more tapped trees comes more sap, and more sap requires bigger and better equipment. We have a brand new evaporator on order that's nearly three times the size of our current evaporator. To continue the chain reaction, a bigger evaporator requires more space... We'll be expanding the sugarhouse into the large section of the garage area for those that are familiar with our setup. Lots of planning and execution ahead, but we'll get 'er done. 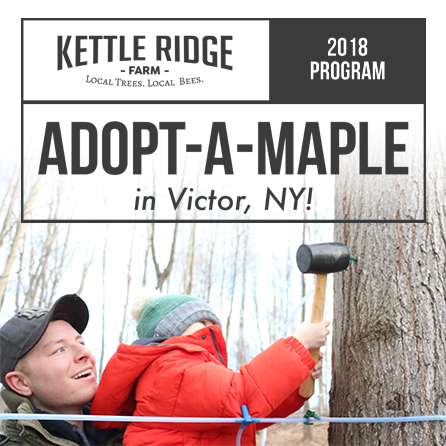 We're VERY excited to announce what we have in store for our 2017 Adopt-a-Maple program. In response to suggestions we've received, we are making a few tweaks here and there to improve the whole experience. We'll be rolling this out in the next week or two... Be on the lookout! Only 30 days to go before KettleFest! For those of you who attended the inaugural KettleFest in 2015, don’t worry, this year’s KettleFest, although a bit bigger, promises to serve up the same ambience you enjoyed last September. We are excited to have many of the same vendors and musicians, along with some unique and interesting additions. We’re pleased to announce that two of Rochester’s favorite bands—The Honey Smugglers and Jackson Cavalier & The Fevertones—are returning to KettleFest! Jackson Cavalier follows at 1:45pm. Nobody is more original than troubadour Jackson. Nobody. To kick things off on the main stage at 10:30am we have the String Chickens. This group plays traditional fiddle music with fantastic energy and skill. For even more of their music, you will find them on the porch stage beginning at noon. 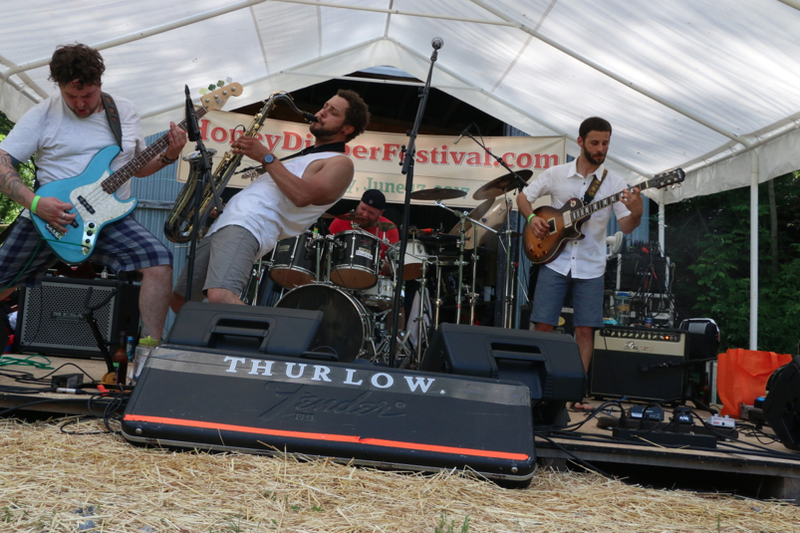 Thurlow will wrap things up on the main stage, beginning at 3:30pm. Just sit back on your hay bale to enjoy their original instrumental music. Or get up and bust out your air guitar or saxophone. Either way. For something a little different, the porch stage offers up a barbershop quartet called Four Tune Chasers at 3:30pm. Last time I spoke with them, they were competing in Nashville. I suppose competitions are big for barbershop quartets. We still have open slots on the porch stage at 10am and 1pm. If you know any local musicians who would like to do some no- or low-amplified “busking” on the porch stage, please let us know. No one goes hungry or thirsty at KettleFest. And the best part is that everything is local! McCann’s Local Meats will be firing up beer can chickens on the grill, the Finger Lakes Food Cart with hots, hams, sausages and garbage plates, and the New York Wine & Culinary Center will provide a variety of sandwiches and wraps to suit any taste. 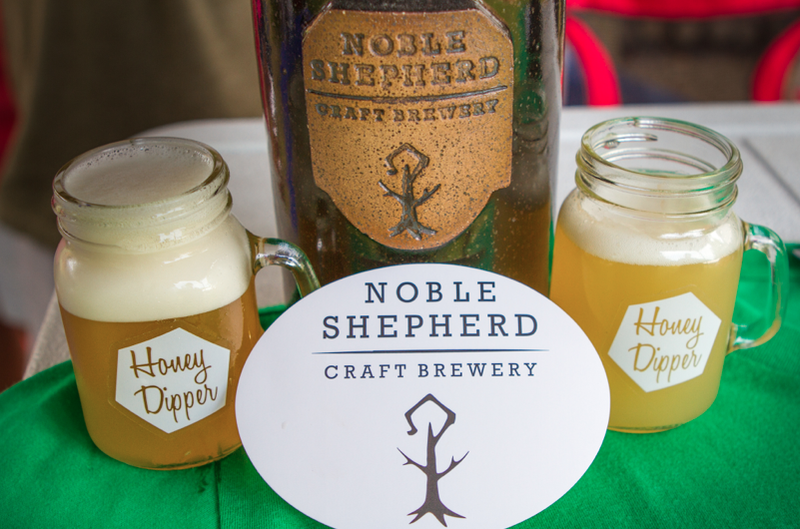 Adults will be able to enjoy pints of beer or cider from VB Brewery, wine from Three Brothers Winery, and samples of spirits from Honeyone Falls Distillery. Coffee and coffee drinks will be available throughout the day from Glen Edith Coffee, while Starla Bakery will be offering fresh baked goodies. We have so many top-tier artisans coming to KettleFest that we can hardly contain ourselves. Several were at KettleFest in 2015 while others will be new to the festival. Feel free to take a look at the details page at KettleFest.com and click through to the artisans’ own website to see what they offer. And be ready to spend some money! You will find all sorts of things for yourself and for others (the holidays are coming!). Our workshops and trail walks were very popular in 2015 and we expect the same for this year. Our favorite chef, Jeff Christiano will be back to demonstrate how to cook with honey and maple, while DEC Forester Brice June will again be offering trail walks and info about mushroom cultivation. Our new workshops offer up knowledge about birding (birding author Hans Kunze), permaculture (expert Patty Love from the Rochester Permaculture Center), and native plants (Jim Engel from White Oak Nursery). Speaking of native plants, we have purchased many potted plants over the years from a variety of sources, and the survival rate of plants from White Oak Nursery far exceeds any other source. Jim Engel has some sort of secret to growing great native plants. 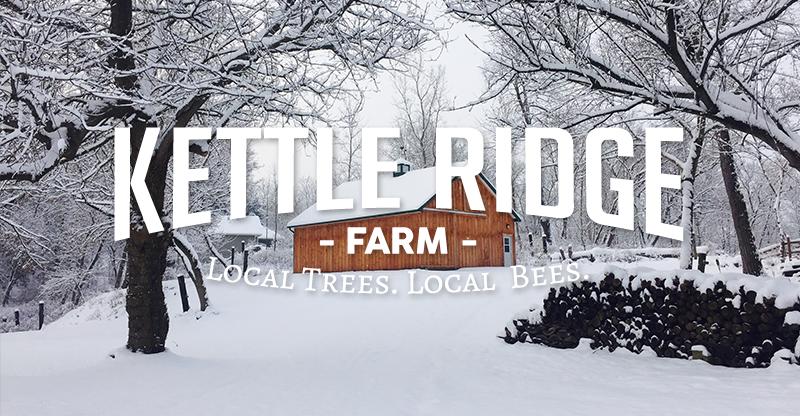 Of course, Chris and Joe from Kettle Ridge Farm will be demonstrating our production of maple syrup and honey throughout the day. Kids are sure to have a memorable KettleFest, with several activities found nowhere else. Topping the list are the famous KettleFest chicken races. Your child will have the opportunity to select their favorite chicken before the hens race through a 50-yard wire tunnel to the finish line. It’s an absolute riot. The races are scheduled at three different times during the day. This year we have reached out to some guests to “call” the chicken races. One of them is State Senator Rich Funke, who chairs the Senate Cultural Affairs, Tourism, Parks & Recreation Committee and who knows a thing or two about sports (if you can call chicken racing a sport). A new activity this year is our beehive painting contest. Kids are invited to paint flower, insects, or other pleasant scenes on the sides of our beehive boxes. Prizes will be awarded. And after the festival, we will actually place the painted boxes in our bee yards. KettleFest would not be possible without the sponsorship support from many local companies. The sponsors are listed on the KettleFest.com home page. Many of these companies are also sponsors in the chicken races. We are especially grateful to our title sponsor: Victor Chevrolet. Not only are they helping to cover a good chunk of our costs, but they will also be providing shuttle service to the overflow parking lot if needed. Life is good for the honeybees at Kettle Ridge Farm. All 15 of our colonies made it through a mild winter and have been enjoying bountiful spring pollen and nectar. With new purchases, hive splits, and captured swarms, we are now up to 35 colonies in four bee yards. What this all means is that we now have honey to sell! Our spring honey is beautiful, light-colored, and delicate. Much of the nectar comes from black locust trees, which had a strong, but brief, flowering period. Many other wildflowers, including clover, were also visited by our bees. We hope to have good crops of summer and fall honey as well. Our summer honey is typically dominated by nectar from basswood, sumac, milkweed, and motherwort. Motherwort is a member of the mint family and actually gives the honey a wonderful slight taste of mint. Fall honey comes primarily from goldenrod and aster. The honey is deep and rich-flavored. The fall honey crystallizes very quickly and is delicious when spread on your morning toast. We love our new packaging and expect you will too. The honey labels were custom-designed by our friends at Bee Paper House and are similar to the maple syrup labels they previously designed for us. To purchase our honey, visit our Products page and order online or stop by our small self-serve stand at 515 Log Cabin Road in Fishers pretty much anytime. (It helps to call Chris at 217-7108 or email chris@kettleridgefarm.com before you come so we can make sure the stand is stocked.) You can also visit one of our growing list of retail outlets including Three Brothers Winery, The NY Wine and Culinary Center in Canandaigua, McCann’s Local Meats, Little Button Craft & Press, and Glen Edith Coffee Roasters in downtown Rochester.